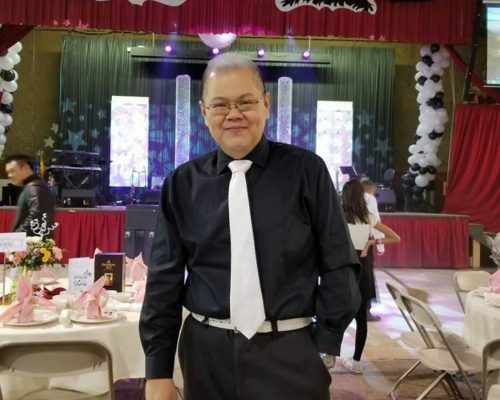 Last week, one of my oldest friends, Dzi Nguyen, took his final breaths. Dzi and I met that first year of high school, both temporarily stationed at Northwest Classen. We sat next to each other one afternoon in Coach Piccolo’s class and started enthusiastically talking about how cool Duran Duran’s 1984 hit “The Reflex” was; even though their comeback smash, Duran Duran really wasn’t a cool thing in the fall of ’93 at Northwest Classen, but, thankfully, they were just cool enough for us. From there, a friendship grew that lasted over 20 years. If you’re ever wondering where it comes from, I have to credit Dzi for giving me the gift of appreciating intricate foodstuffs, delicacies like roasted chicken feet, jellyfish salad and, especially, pig intestines. 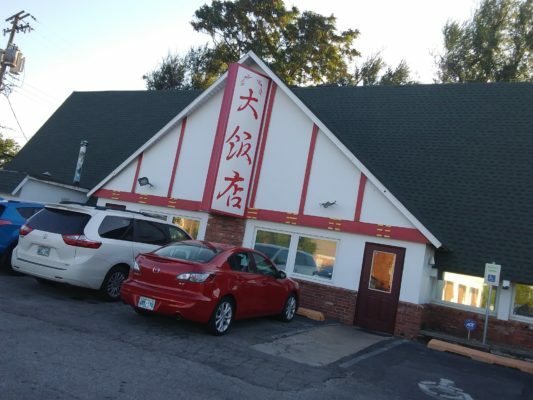 Most of these culinary lessons started and ended at Chow’s Chinese Restaurant at 3033 N. May Ave. Just a block or so down from Northwest Classen, many times we’d sneak off-campus, eating a quick lunch there. To this day, their menu is still a true Oklahoma City original. I went back there recently, to toast the good times I had with Dzi, to remember some of those lost realities and, most importantly, to see him off into the next life, as best I could. 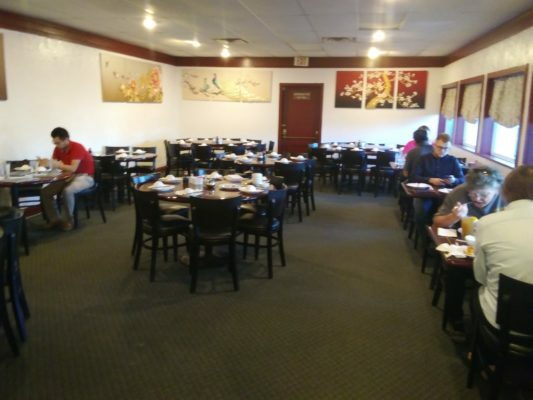 With Duran Duran in my old Discman, I settled in at Chow’s, at our old table—anywhere near the windows, really—and took a look around the joint. It really hasn’t changed at all in the years since I was last here, and I doubt it had really changed in the years before that. With a menu as voluminous as a secret Asian cooking class, the offerings range from mass populist favorites such as Peking Spare Ribs and Pan-Fried Dumplings to the downright obscure ephemera such as Boneless Duck Feet and Black Mushrooms. For an appetizer, I felt as if I should order something I’ve never had before, so I went with the Hot and Spicy Pork Ear ($7.95). Cut into small crispy slivers and served moderately chilled, the sauce that covered the plate was full of pepper seeds and other spices that delivered a most volatile but wholly welcomed delayed reaction of heat that grew with ever spoonful of the pig’s ears. Dzi probably would’ve made a joke about my constant sips of ice water after every bite, I thought to myself. 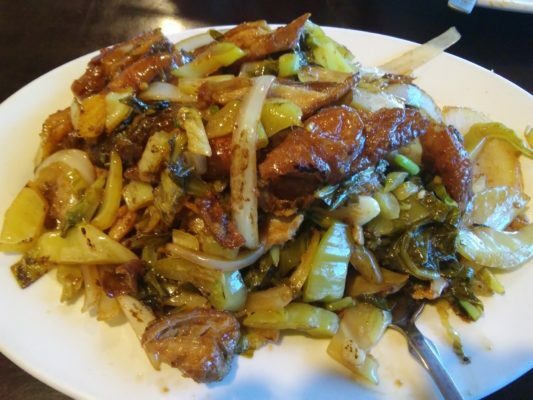 As for my main dish, however, I selected what I consider one of Chow’s true classics and one of the first items I had ever ordered from there, the aforementioned Pork Intestines with Preserved Vegetables ($10.95). 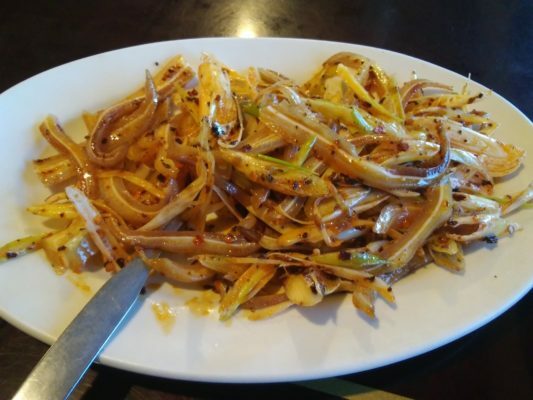 I’ve had this dish in every Chinese restaurant from here to New York City and honestly, Chow’s is the only place that has ever gotten this gut-meat delight perfect, at least according to my admittedly selfish tastes. Practically overflowing off my plate, I took in the beautifully acrid scent of the diced pork intestines, clean and hollowed, mingling perfectly with the plastic soul of “Save a Prayer” on my headphones. Finely pan-fried to a dark brown hue, with the pickled greens of mostly cabbage and onions sautéed as a brother in arms, it coated everything in a naturally sweet glaze. It was just as I remembered, having craved it for quite sometime now. I last saw Dzi a few months ago, before I went to the hospital. We had made plans to hit up Chester’s Pool Hall to not only review their much-mythologized onion burgers, but he was gonna teach me how to play pool like a regular Oklahoma Fats. It never happened but, as I sat there in Chow’s, looking out the window down towards Northwest, I smiled and knew I would see him sometime soon, welcoming me with a drink in one hand and a copy of Seven and the Ragged Tiger in the other. Cómpralo ya! Next post The Oklahoman’s new owners don’t know they’re not supposed to like us! Chow’s actually isn’t BYOB anymore but the food is still amazing. I guess I’ll remove the incorrect edit. That was a sweet tribute to an obviously cool guy. Condolences to all who knew and loved him. Chows is one of those places that I always meant to go but they only times I’d manage to come by they’d be closed for the annual(?) vacation. I’m still a little bummed that I never made it. Is that the old International House of Pancakes? Or Billie Lee Pies? I think Billie Lee was on 39th Expy. (I used to have a pie plate from them). My old stomping grounds back in the 70s. Yes. It was an IHOP. Worked with Dzi. Dude was cool as hell and will be missed greatly. What a wonderful tribute to our friend, Dzi. I’ve known Dzi since Kindergarten. We went to Rosary Catholic School. He was my oldest friend. I will miss him every day as will everyone that knew him. Such a genuinely good person. Thanks for honoring him in this article! I love stuffing my face that place! Dzi was one of the nicest humans on the planet! Wow. I don’t know if you remember me but I was in Coach Piccolo’s class with you guys. I don’t think I had seen Dzi in 20 years and only a handful of times sine he left NWC but he always seemed like a great guy. I am sorry for your loss.